Every new year in Iran starts with spring and a celebration called Norouz. Film screening in Norouz is of high importance because there is high enthusiasm among people to go to movie theaters because of long holidays. The two top items on spring screening list this year included The Deportees 3 (Massoud Dehnamaki) and Nader and Simin: A Separation (Asghar Farhadi). The Deportees 1, which had been already screened in Norouz holidays, was the bestselling movie in the whole history of the Iranian cinema. High sales of the second episode had increased hope that the third episode would be also a blockbuster. The Deportees trilogy is about a group of hoodlums, thieves and addicts who go to the warfronts with Iraq in the first episode. In the second episode, they are taken into captivity by Iraqis and in the third episode they get involved in presidential election. The main theme is lame jokes and low quality comedy. Since The Deportees 3 was supposed to be full of comic allusions to reformist presidential candidates, their political supporters had announced that they would boycott the film. Of course, Dehnamaki’s personality was another reason. During tense presidential election which was held two years ago, he was a staunch supporter of President Ahmadinejad. He has also a background of leading violent street mobs against intellectual figures some 15-20 years ago. The Deportees project enjoyed full support of Ahmadinejad’s government and the then minister of culture took an unprecedented measure when visited behind the scenes. Asghar Farhadi’s film, however, was favorite of critics, people and judges of Fajr International Film Festival. It was also a hit in Berlin Film Festival. Opponents of The Deportees 3 urged people to see Nader and Simin: A Separation and a bipolar atmosphere took shape around the two films. Unlike Dehnamaki’s populist movie, Nader and Simin: A Separation was an intellectual production and Farhadi was not supported by state cultural officials. 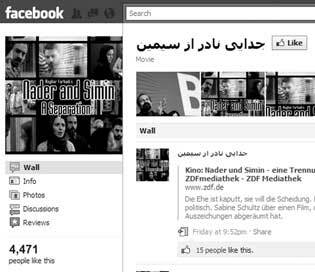 A campaign was launched on Facebook during Norouz holidays to support Asghar Farhadi which aimed to get people see Nader and Simin: A Separation and avoid of watching The Deportees 3. On the other hand, Dehnamaki’s supporters stood against Farhadi and his film charging him of giving a disappointing image of Iran. Box office returns of each film had, thus, turned into a criterion for their supporters to measure failure or success of their favorite film. Dehnamaki charged his opponents with obstructionism and even smuggling low quality version of his film. Farhadi, however, remained silent. The Deportees 3, which was screened at 100 theaters through the country, earned about 5.6 million dollars while Nader and Simin: A Separation, which was screened at 50 theaters, sold about 3.3 million dollars. State supports considered this a victory for Dehnamaki and sign of people’s opposition to intellectuals. Farhadi’s supporters, on the other hand, mentioned lower number of theaters to argue that Farhadi’s film has been victorious. Meanwhile, some analysts were against such currents from the beginning and believed that generalizing political disputes to movies was incorrect.